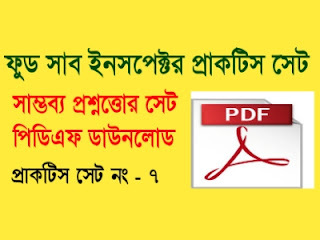 PSC Food Sub Inspector Notes pdf provided here. Most of the Bengal students search on Internet PSC Food sub-inspector notes. But they can not find good quality notes. We solve this problem. Here, you can get PSC Food Sub inspector notes, previous year question Syllabus etc. PSC food Sub Inspector exam is important for Bengal Job Seekers. So you should start practice right now. Today GK Solve share PSC Food Sub Inspector Notes 7 PDF Download link. Details of PDF Book and download link are below here. Easily download this Practice set and start practice. General Knowledge, History, Geography Static GK is important for PSC Food Sub Inspector Exam. sir alp ka results kab tak aayega .